Arriving by phone? Click the player arrow to start listening now. The Russian government is hiding the massive fires in Siberia, says Alexey Yaroshenko of Greenpeace in Moscow. It’s another sign climate chaos has arrived. From Germany, Isabel Rosa explains science of new emissions baked in, no matter what we do. David Turnbull of Oil Change International on report “Sky’s the Limit” – why there can be no new oil and gas wells or coal mines. This show is a jam-packed with voices of the climate crisis from around the world. 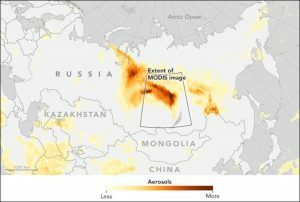 We start in Moscow, where vast areas of Siberia have burned in September, the month when cold rains or even snow should have ended the fire season. It’s yet another sign of a world entering a time of climate chaos. Then we go for uncomfortable new science from Germany. A new major source of greenhouse gases has been uncovered, something completely missing from reports by the Intergovernmental Panel on Climate Change and all the talk of the remaining carbon budget. No I’m not talking about methane from the Arctic, or the shrinking reflective power of ice and snow around the planet. It’s the forests. Even if we stopped all deforestation today, the carbon from tropical forests already cut in places like Brazil and Indonesia will continue to rise up into the atmosphere. It’s as though we’ve discovered a second fossil fuel civilization. Finally, I cover the energy report that fuels even more stringent warnings from activist writers like Bill McKibben and George Monbiot. We talk with an author of the Sky’s the Limit report. That says multinational companies and oil states should abandon any further exploration for new oil, gas or coal. That means their book assets are inflated, and that means pension funds and investors should flee fossil fuel companies and their dependent industries. I don’t think that goes far enough, and I’ll tell you why. I’m Alex. Welcome to Radio Ecoshock, where minds and hearts become energized. Alexey Yaroshenko leads the forest campaign for Greenpeace Russia. He has a PhD in botany, and has published on the Boreal forest. Yaroshenko says the fire danger in Russia is hundreds of times greater than officially admitted. If so, the carbon plume going into the atmosphere is far more dangerous than reported. The whole story is lately missing in the West. 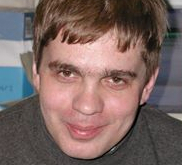 From Moscow, Radio Ecoshock is pleased to welcome Dr. Alexey Yaroshenko. I didn’t even know Greenpeace provided firefighters in Russia! Apparently for over a decade Greenpeace has had a dedicated team of professionals that go into fire areas. It’s hard to understand why anyone would want to beat them up. Yaroshenko says there was a lot of intimidation, and even beatings, or environmentalists in the 1990’s. Then it got better, but lately it’s getting worse. The rolling smoke covered Bratsk and the surrounding region for about one month. It’s finally cleared up now. The situation was so bad in Siberia that barges were unable to go up the major rivers. That’s serious, because rivers are the highways of Siberia. Small villages depend on barged supplies to get through the winter, and there isn’t much time left before ice seals them up. In this case, Alexey says the risk is not to pipelines themselves, because they are underground. But fires came with meters of necessary infrastructure, like pumping stations. The oil companies also had trouble getting workers into dangerous fire areas. Why would the government neglect to report the real situation? Mostly it’s bureaucrats hanging on to their jobs. Yaroshenko says no one in the last seven years has been punished for failing to report fires. But government workers have been pressured to report only good news. “No problems here, we’re doing a great job” is the theme in Russia these days. That’s a big claim. I did a special report on the 2010 Russian wildfires, and they were frightening. At the time I interviewed Vladimir Tchouprov of Greenpeace Russia. The insurance company Munich Re claimed 56,000 people died from the effects of heat and air pollution in 2010. Why does he say this year’s fires are even larger? In the case of the 2016 fires, Alexey is not saying the casualties and damage are greater than in 2010. Those fires hit more populated areas, including the Moscow region. Yaroshenko says this year’s fire cover a greater area than than in 2010. The 2016 fires are huge, even though they affect fewer people. Even so, at least 5 million people were affected by this year’s fires, which is a large number in sparsely settled Siberia. All those forests burning means yet another burst of greenhouse gases into the atmosphere. I expect soon “natural” sources like this will over-take human emissions, removing any control we can muster. In a coming interview, we’ll talk with a scientist who says that has already happened. Climate change is warming Russia faster than most other places on Earth. What should the Russian government do about increasing fires? First of all, Yaroshenko says, the Russian government needs to be truthful about the full extent of fires burning. They can’t hide the heat and smoke from satellites – or from people living in that area! The American and Canadian governments also don’t fight forest fires in the far North, but they do not hide the figures about them. We can’t know the full carbon impact unless we have accurate figures. Secondly, Alexey says the Russian government needs to reconsider the new forest legislation from 2007. Previously, even to the time of the Tsars, the forest economy set aside or paid some money for preventing and fighting forest fires. In 2007, that was all set aside, and the regional governments became responsible for paying for fire services. But those governments are already very low on funds, so it doesn’t happen. Russia needs to go back to a system where companies cutting the forests also pay for forest protection. Third, the government needs to extend burning bans for the whole fire season, not just spring. These burning bans did cut spring fires by about one third this year, Yaroshenko calculates. But then the hot summer and longer fire season, running into the fall as we see, were not covered. There needs to be a strong policing system to stamp out the practice of intentional burns. We’ve already seen science saying the Arctic is warming faster than anywhere else on Earth. Plus more science has come out documenting the longer fire season, with earlier spring melt of the snow cover, and later arrival of snow in the fall. A couple of decades ago the residents of Siberia could count on cold rains, or even snow, in September. This year is was hot and burning instead, and that’s the new trend. In the interview, Yaroshenko said Siberia was only a little bit hotter than usual this year. The real problem and climate impact was the dry, dry weather, extending into drought in many regions. That makes the forest dryer and ready to burn, while reducing the water resources needed to fight fires. I first heard about “zombie emissions” from this article in this blog post by Desdemona Despair. I check that blog daily. The basic idea: when the tropical forests were cut down (whether in Brazil, Indonesia or Africa) – a huge biomass was left on the ground. That is starting to rot, leading to more greenhouse gases heading into the atmosphere. It’s already done, a guaranteed new flow of carbon dioxide and methane. We can’t stop it. Former NASA scientist James Hansen often speaks of global warming “still in the pipeline”. The actual contributions to atmospheric change have been masked by the dimming effect of other air pollution. Our next guest might call that a climate “debt” – except she’s documented a different source of greenhouse gases that cannot be stopped. The press has labelled them “zombie emissions”. We reach out to the lead author, Dr. Isabel Rosa. 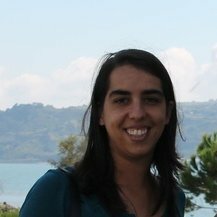 She has a PhD in Computational Ecology, and works with the German Centre for Integrative Biodiversity Research. I reached her in Leipzig, Germany. Groups like the IPCC or the World Bank calculate the “carbon budget” – the amount of fossil fuels we can still burn and stay below two degrees C of global mean temperature rise. But all those calculations do not include this newly revealed source of carbon. Isabel tells us the emissions from tropical deforestation time-lag will be equal to the carbon loss from about a decade of deforestation. That means even if we stopped cutting down the tropical rainforests today, these emissions are still coming. Rosa talks about it as a carbon “debt” rather than “zombie emissions” which is a label created by the media. Deforestation creates time-lagged greenhouse gases. Those greenhouse gases lead to warming and drying that cause more deforestation, which leads to more emissions. It’s yet another positive feed-back effect. Dr. Guy MacPherson should add this to his list of self-reinforcing feedback loops. A different frightening time lag also appeared in this study. It takes a while for endangered species to go extinct after they lose their tropical forest habitat. For a while they continue, trying to adapt, before they fail. We haven’t seen the real number of extinctions yet; those are still developing. It’s like the future has already happened. To read this paper for yourself, get the abstract here – and download the full text from the link in upper right. Or use this link to read the full paper as a .pdf file. The title is “The Environmental Legacy of Modern Tropical Deforestation”, as published in the Journal Current Biology. I think three different groups of activists, scientists and policy makers need to tune into this paper. Obviously climate activists and forest activists need to listen and learn. But biologists monitoring species extinction need to find it as well. It’s amazing that a single mechanism results in such diverse changes, to both species and the atmosphere. Right now, this year and every year, giant oil, gas and coal multinationals, and nationalized fossil fuel countries, are spending a large part of their income trying to find new fields, new wells, and new mines. They are pushing national governments to support or even fund more pipelines, train lines, ports and infrastructure to make more carbon power happen. Media is carefully crafted to make us fearful of a change, to make us support more subsidies and cheap leases. A powerful new report details why the atmosphere cannot withstand any more exploration and development by the fossil fuel industry. But even this information, startling as it may be for the public and investors, doesn’t go far enough to avoid a climate catastrophe. After the interview, I’ll explain why. But how does McKibben know that? Is it just a belief? Nope. It’s based on the math coming out of a new study commissioned by over a dozen NGO’s. Here’s another question for you: How much greenhouse gas will come from our existing energy system, as it is, with no further exploration or development? Those numbers are hard to get. A group called “Oil Change International” found the figures, and they’ve released them in a free report. The title is “The Sky’s the Limit, Why The Paris Climate Goals Require A Managed Decline of Fossil Fuel Production“. To talk about all this, we reached David Turnbull. He’s the Campaigns Director of Oil Change International, and a contributor to this new report. Previously David worked with the Climate Action Network. Right now in the United States, Native Americans are trying to stop the Dakota Access pipeline construction. At the same time, Canadian Prime Minister Justin Trudeau must decide whether to allow a pipeline expansion from the Tar Sands to Vancouver harbour. According to the data in this new report, the only sane answer is “no”. The fossil fuel industry spends billions and billions looking for new sources of oil and gas. Their budgets, and their share prices, depend on finding and claiming those reserves. This report from Oil Change International shows everyone, including pension fund managers and individual investors, why buying into oil, gas or coal is such a bad idea. Not only does further investment bankrupt the climate, these companies are already losing share value rapidly due to divestment. The days of exploring forever and claiming huge reserves is over. Just ask the bankrupt coal companies and their investors. There was just a major storm in Australia. On September 28th, a larger part of South Australia lost electric power. The grid went down, as hurricane-force winds blew over and destroyed large towers carrying power. The Australian government, generally supported by the media monopoly owned by climate opponent Rupert Murdoch, turned this into an opportunity to question any move to alternative energy. The state power operator said the source of electricity had nothing to do with it. The storm became a political club in the hands of the federal Conservative government, which is pushing for gigantic new coal mines and a matching super-coal port on the edge of the Great Barrier Reef. Here in Canada, one media company, Global Television, and owned by Shaw Media, ran story after story about rural customers paying too much for electricity. That eventually whipped up enough public pressure that the government again blamed the green energy industry. The Ontario government promised to scale back wind and solar. The media chain sounded hopeful this would spread to the rest of Canada. A pull-back from solar would benefit the beleaguered Tar Sands in Alberta, and supposedly help the Canadian economy. Just one more example. The Financial Editor of Britain’s Telegraph newspaper is Ambrose Evans-Pritchard. Ambrose can be very insightful, if biased against Europe. He’s written often about the promise of alternative energy. And yet Evans-Pritchard can then write an article totally hopeful about the return of higher oil prices, and talking about rebuilding the fossil fuel industry as a good and necessary thing. Time and again, the mainstream media willfully ignore the huge risk of such fossil fantasies. Time and again, they represent the powerful status quo of fossil fuel dominance in the world economy and our lives. Watch out for those stories that tell you solar or wind power is dangerous somehow, that it isn’t real, that it can’t power our lives. Quickly ask yourself on every occasion: Why are they telling you that? Who do they represent? But even activists who have a good track record of fighting for climate action, as David Turnbull has, may not be able to face or focus on the awful truth of our situation. Or perhaps they can only tell us what we the fossil-crazed public can tolerate at this time. HOW MUCH LONGER CAN WE BURN FOSSIL FUELS? In this interview, David Turnbull says if we want to stay at or below 1.5 degrees C. global warming, we have a couple of decades to keep burning fossil fuels while we make a transition. Dr. Robert Watson, former Chair of the IPCC says passing the 1.5 degree mark is now inevitable. Dr. James Hansen and others say using the global mean temperature measurement is dangerous in itself. The reasons for that are a bit complicated, involving our developing understanding of how sensitive the climate is, a belated comprehension of the warming of the oceans, and the many risks not covered by straight temperature change. The oceans turning more acidic, threatening the basis of the world food chain, is just one example where temperature doesn’t tell the whole story. I disagree that we have anything like two decades left to burn fossil fuels. Instead, we need emergency action, including planned power reductions, or even rolling cuts, coupled with huge government financing to swing over to a combination of massively reduced energy use and very localized, direct power by solar, wind, geothermal or, if necessary, hydro power. We may only have 5 years to save ourselves, and protect our descendants from the worst. That is why I support the call for planetary emergency action to save the climate. It’s not a radical call. In fact, it’s pretty well too late, a last ditch call for sanity in the face of a super-threat. There isn’t time in this program to tell you much about the new “Climate Chance! Campaign”. A multi-faceted group of experts, co-ordinated at this time by the Landscape Architecture Foundation, is applying for a 100 million dollar grant to develop an emergency action plan. The goal is to stave off the worst of climate change, to give ourselves and our descendants a chance. The Mission Architect is Martha Schwartz from the Harvard Graduate School of Design. Martha lectures and designs projects all over the world. Find more about work her here. I’m looking into how I can help this appeal, perhaps by connecting with the many famous scientists and authors that have been on the show. We’ll see. Can you see a way to fit climate action into your life? Can you talk it up, and lead by example. Can we all do it, by the millions, until we find a way out of the carbon trap? Thank you for listening to Radio Ecoshock. I know it’s a big investment of your time, in these days of 140 character news bites and swirling headlines. It’s my goal to help you tune into life-saving information, directly from the source. Please support my urgent fundraising appeal, to help the show keep going. I’ve been happy to be one of your supporters and wish I could afford more. Since the 1960s I have been trying to keep abreast of the global consequences of too many people in a planet of finite resources and increasing damage to the biosphere. The scientific evidence is bringing our view of the future into ever sharper focus and the picture would alarm the most conservative optimist were we to have a real debate over real facts, but that doesn’t happen on mainstream media. It only comes from people like you. I can’t thank you enough.